characterized by a chronic condition that can lead to many health conditions, including mild inflammation, severe gum damage and loss of teeth if left untreated. Moreover, periodontal disease can affect the overall health of a person, and has been connected to a greater risk of developing stroke and heart disease. Gum disease can result in tissue damage and inflammation that can cause the gums to recede. The severity of periodontal disease is determined by the “pockets” or depth of the extra space that forms as the gum tissue recedes..
Can Gum Disease affect my dental implants? Research shows that dental implants are successful in about 95% of cases. Before implant treatment begins the surgeon will determine if there is sufficient bone available for implants to be placed. Once the implants have healed it is very important that implants are correctly looked after. The long term success of dental implants is very much dependent on proper maintenance following dental implant treatment. Most dental implants should last a lifetime. However, your health does play an important role. Those patients which are diabetic, smokers or heavy drinkers may be more susceptible to gum disease and implant failure. In addition, some patients are heavy grinders (bruxers) which can also affect the implants. How to look after dental implants. Regular visits to your implant surgeon after treatment is completed. Periapical radiographs to check if the bone around the implant is in good conditions. Probing to check for tartar below the gum and prevent periodontal problems. Motility test to see if the any of the abutment screws have loosened. 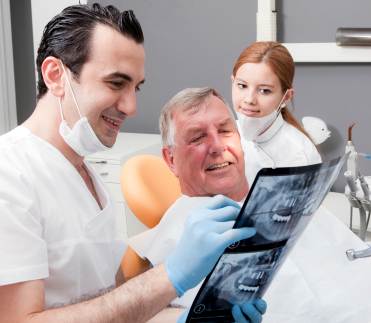 A patient with dental implants should go for a review every six months. There are two types of gum disease, gingivitis and periodontitis. Gingivitis or gingiva involves mild to moderate gum inflammation. Without proper treatment, this dental condition can develop into a more serious oral condition, known as periodontitis, which can cause tooth loss and damage to the jaw bone. Gingivitis causes irritated, swollen gums that bleed easily. Proper oral hygiene, including daily brushing and flossing, as well as regular teeth cleanings can help prevent and reverse this gum disease. Periodontitis is a serious gum infection that results from untreated gingivitis. In this oral condition, the gums significantly pull away from the teeth, resulting in the creation of infected pockets. As the immune system of your body struggles to combat this infection, bones and tissues might start to break down. If left untreated, the connective tissue, gums, and jaw bones supporting the teeth might all deteriorate. Eventually, your teeth will either become loose and fall out or have to be removed by a dental specialist. Gum disease has been associated with a higher risk of stroke, heart disease, coronary artery disease, low birth weight babies, respiratory problems, poorly controlled diabetes and other health conditions. Ready To Find Out More about Gum Disease?